Little, Brown and Company, 9780316548915, 400pp. An extraordinary memoir from an Iranian journalist in exile about leaving her country, challenging tradition and sparking an online movement against compulsory hijab. A photo on Masih's Facebook page: a woman standing proudly, face bare, hair blowing in the wind. Her crime: removing her veil, or hijab, which is compulsory for women in Iran. This is the self-portrait that sparked 'My Stealthy Freedom,' a social media campaign that went viral. But Masih is so much more than the arresting face that sparked a campaign inspiring women to find their voices. She's also a world-class journalist whose personal story, told in her unforgettably bold and spirited voice, is emotional and inspiring. She grew up in a traditional village where her mother, a tailor and respected figure in the community, was the exception to the rule in a culture where women reside in their husbands' shadows. As a teenager, Masih was arrested for political activism and was surprised to discover she was pregnant while in police custody. When she was released, she married quickly and followed her young husband to Tehran where she was later served divorce papers to the shame and embarrassment of her religiously conservative family. Masih spent nine years struggling to regain custody of her beloved only son and was forced into exile, leaving her homeland and her heritage. Following Donald Trump's notorious immigration ban, Masih found herself separated from her child, who lives abroad, once again. Masoumeh (Masih) Alinejad-Ghomi was born in 1976 in Ghomikola, Babol. She is an award-winning Iranian journalist, broadcaster, blogger and founder of the My Stealthy Freedom movement. A 2011 graduate of Oxford Brookes University, Alinejad currently reports and presents a weekly TV segment on VOA, called Tablet, where she mixes hard news and satire. Masih has been published in a variety of newspapers and magazines, including Huffington Post, Time magazine and the Washington Post. She lives in Brooklyn, New York. 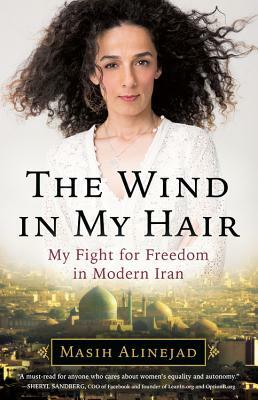 book comes at a time of renewed energy within the feminist movement, and Ms.
"[Masih's] descriptions of life as a journalist and activist will captivate readers interested in Iran, international affairs, gender equality, and human rights."